7:30 a.m. on Wednesday morning we were rearing to get out on the Bonneville Salt Flats to make photographs with the camera obscura. Our frolic in the mud the night before had caused some apprehension but thorough testing of the ground assured us of a securely packed salt flat with only a little water from the rain resting on top. 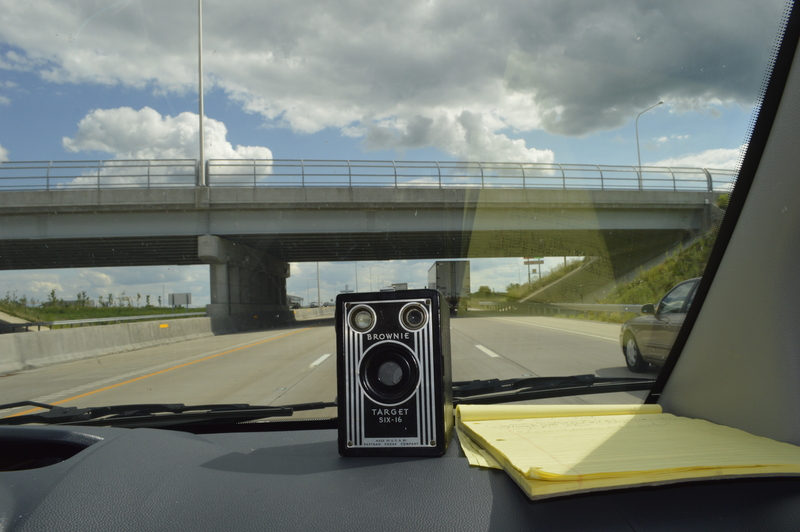 In cinematic form we sped through to the flats with our video camera rolling. The loaded down Ford maxed out at 93mph but driving on the famed salt was an experience non-the less. We made a beeline straight into the immense salty white expanse while I stared off, hypnotized by the road cones and mountain ranges swirling past us. Sunrise just outside the Bonneville Speedway. Photo by Stephen Takacs. Days 1-3: Towards Colorado Middle America and Crisis in Kansas. On 10:15 A.M. on Thursday, July 17th, Stephen and I blazed a trail westward from Columbus. We had been at his studio until 3:00 A.M. the night before; packing, plotting, and recording one hell of an inspirational monologue from a fellow artist at 400 West Rich. The van was filled to capacity with the world’s largest Brownie camera, 5 tripods, 12 other cameras of various sizes and styles, Stephen’s homemade developing cart, a guitar, a ukulele, camping gear, darkroom supplies, and a cooler filled with food. We drove without cruise control, rolled the windows down, and chain-smoked unapologetically. Our only mission for the first day was to put as many miles between Ohio and us as possible. The first 600 dusty miles brought us through western Ohio, Indiana, Illinois, and Eastern Missouri. I picked out a campsite about an hour west of St. Louis, Little Lost Creek Nature Reserve. I really had no idea what to expect, and was pleasantly surprised when we discovered a secluded, shady site well removed from the highway. Micah Chamberlain and Stephen Takacs taking the obligatory selfie before departing Columbus. Upon arrival, Steve serenaded me on the ukulele while I prepared our kielbasa and canned sauerkraut dinner over a fire. We drank some tall cans of beer and waxed philosophic. I brought two hammocks along and that first night on the road found us sleeping suspended by pine trees. Camping by hammock is super comfortable. Normally, I sleep like a baby but late that night, I was startled awake by coyotes howling recklessly from what sounded like 20 yards away. Unable to fall back asleep, I nervously awaited sunrise, losing myself in the textures and sounds of the woods. Serious moonlight gently brushed the top of the old pines, cool air swaying above our heads. I listened to the crickets, frogs, and coyote as one listens to an orchestra. Breathing gently with the crescendos and lulls. Each creature instinctively knowing its place, without a conductor they perform in perfect time. As the van eased through hills towards Lake Wilson, the sunset highlighted the rocks filling us with awe. Steve had expressed interest in shooting a wind farm, and on the approach to the lake the prairie landscape populated with giant turbines and the occasional limestone outcropping seemed perfect; the kind of landscape we were thirsty for. 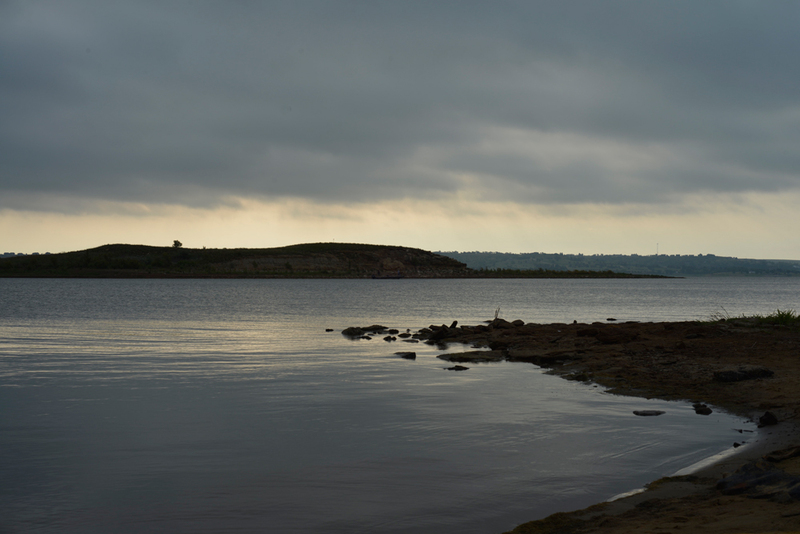 Inspired to shoot the next day, we slowly rolled around to the east side of the lake to inquire about a campsite. Connie Cash was checking in RV’s at an info kiosk across the damn. Connie was the first person we made a real connection with on this trip. She was excited to guide us to all sorts of strange eccentric local attractions, the kind of things unique to rural Kansas. Following her suggestion, we checked into a Camp Lucas on the North shore of the lake. We ate apples and cheese in the cool windy twilight as we set up camp. Our plan had been continue to Denver in the morning, but, like an unexpected love interest, Kansas had seduced us with her landscapes, setting the stage for our first Brownie shoot. Following Connie’s suggestion, our first stop on Saturday was an old dusty town called Lucas, 14 miles north of Lake Wilson. Known for it’s eccentric art installations. 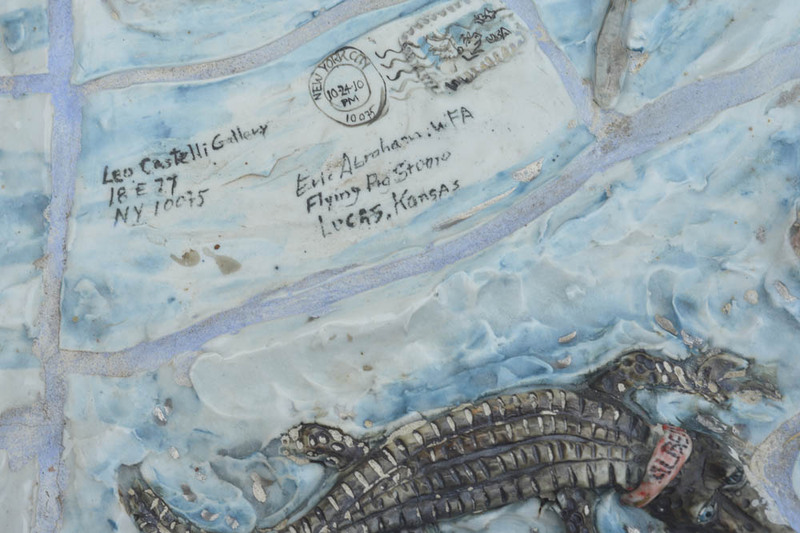 This funky town in rural Kansas is full of limestone carvings, industrial farming equipment, old limestone buildings, and numerous oddball tourist attractions. 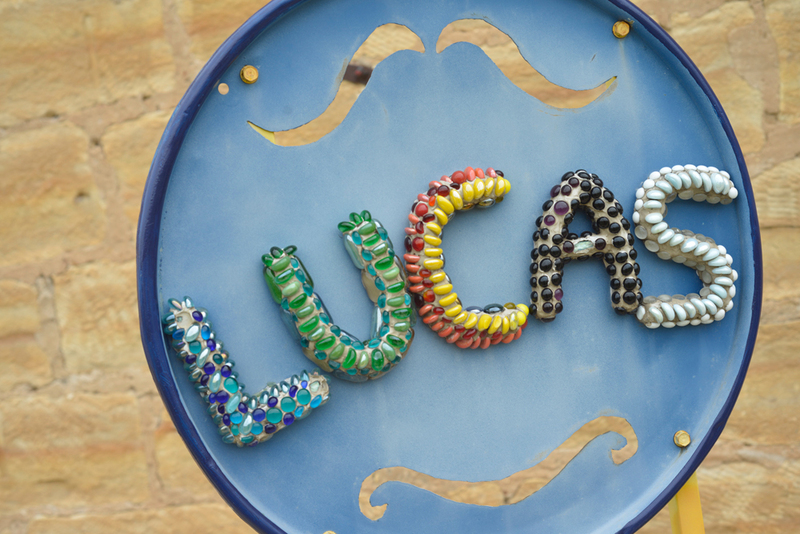 From a giant mosaic sculpture of a toilet to the Garden of Eden – the residence of an early 20th century sculptor concerned with class struggle – I found Lucas thoroughly full of the kind of weird that only the rural Midwest can provide. (Inside of the Garden of Eden, the sculptor is preserved in a glass casket.) In Lucas, a 4th generation meat market making old school bologna and pepperoni from a 100-year old family recipe caught our attention as a potential subject for the Brownie In Motion project. The owner seemed uncomfortable with the idea but tipped us off about getting access to the wind farms the next county over. An hour later, driving along unpaved country roads, we knocked on the doors of several farmhouses to ask permission to photograph on their land. On the third try, a greasy farm dog greeted us and a quiet old man gave us permission to shoot in his pasture down the road. A few miles later, we saw what we thought was a good spot to setup, tall grass and corn beneath massive spinning industrial wind turbines. 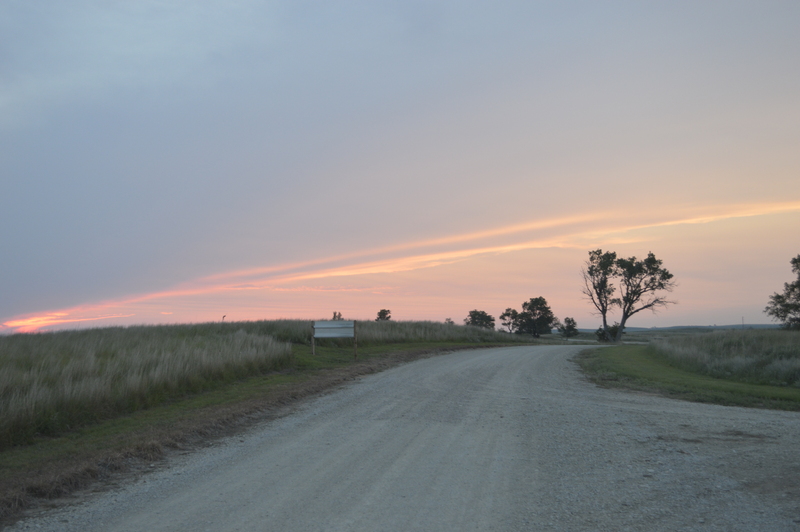 The location was surreal, scenic, and reassuringly Kansas. Brimming with optimism, our dynamic duo pulled in and began setting up. Seven hours later, things were very different. 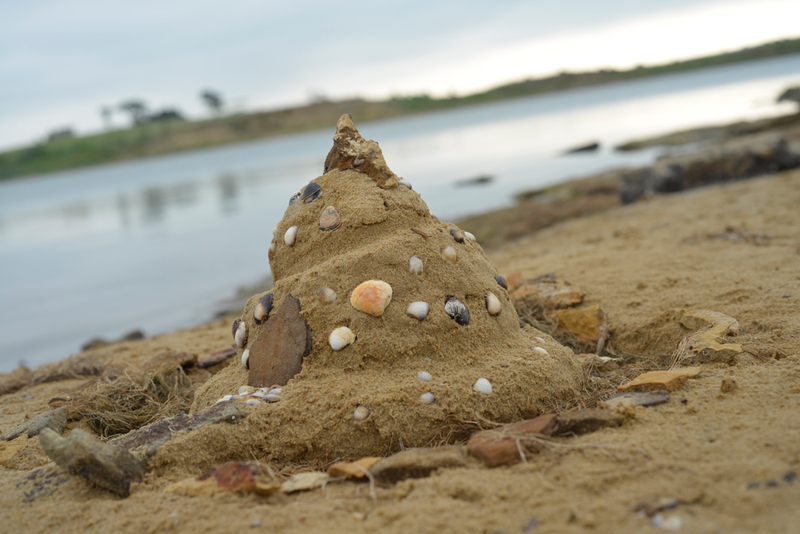 After battling with the wind, tripping on gopher holes, being harassed by biting flies, and baking alive inside the Brownie, it seemed failure was upon us. The wind was a steady 20 mph and the Brownie’s lens shook uncontrollably as a result. The first positive shots weren’t developing well, and then the negatives couldn’t focus because of the vibration. Stephen is a persistent worker though; despite the 94-degree heat, we kept shooting until we ran out of light. I was sunburned, dehydrated, impatient, and ready to give up after this flop. Our gear was splayed out in the tall prairie grass, making packing up an even greater frustration for the both of us. Sitting in the car and waiting for Stephen, misery sank in quickly. I didn’t feel like talking. I was twitchy and itchy from black fly bites, and could feel my tired muscles screaming for hydration. The silence was overwhelming in the car, my ears longing for music. I grabbed the ipod and desperately scanned for something to get us back to camp. “Get the hell away from this nightmare.” I was thinking to myself. I was ready to tuck tail and head home, when Stephen offered me a pull of Black Velvet. Neil Young’s Harvest, a shot of whiskey, and a few smokes on the way back had us belting out each tune with reckless abandon. Our spirits rose high once again at the sigh of Lake Wilson in the prairie sunset. Later that night relaxing under the stars was all we would manage. A few meteors glinting in the north, and the great blanket of stars pulled me into sleep. We had skirted with disaster and made it out the other end. Even with a bad taste in our mouths, tomorrow back on the road would be a better day. 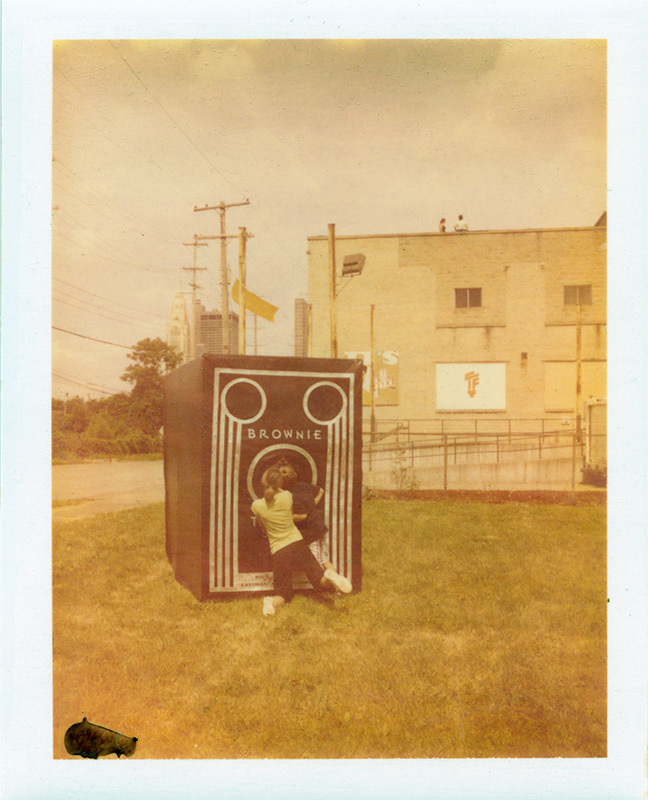 The Brownie was a very successful and influential line of cameras introduced by Kodak starting in 1900. It maintained great commercial success through the 50’s and 60’s and changed photography from a highly complicated craft into something you can take on a family vacation. 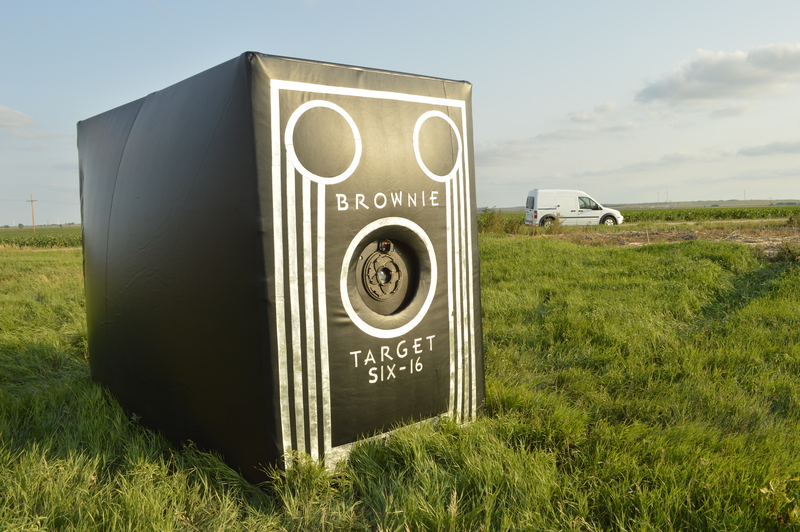 My friend, Stephen Takacs has built a 17x scale model of the Brownie that makes giant prints on analog photo paper. 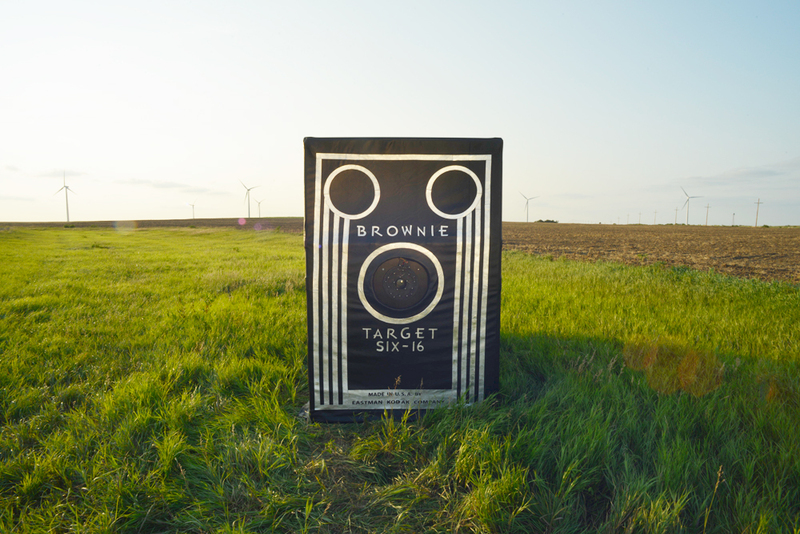 Stephen’s Brownie also functions as a darkroom, interactive installation and a sweat lodge (depending on the weather.) 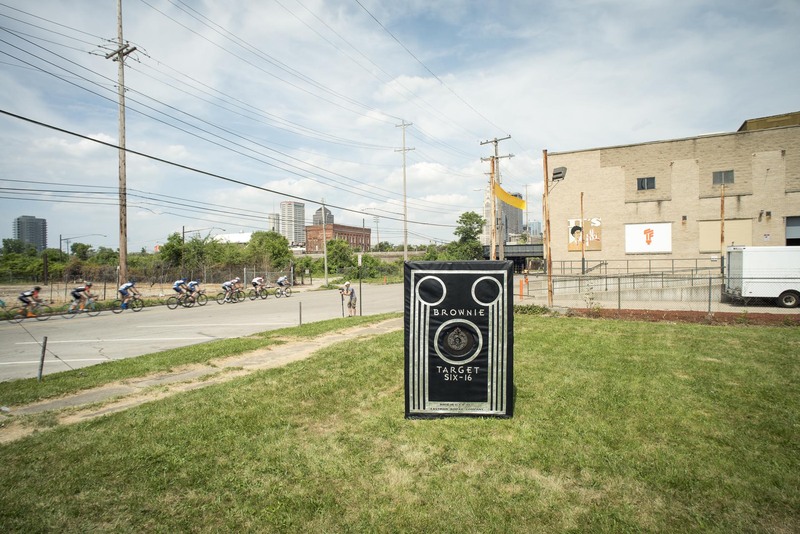 We will be taking this giant camera across the country this summer and working on a project we call “Brownie In Motion.” The concept behind this trip is to find and photograph craftsman whose skills might otherwise be forgotten. This documentary / performance project seeks to raise awareness about disappearing crafts to perhaps build interest in these dying trades. By the way my name is Micah, I’ll be writing about the journey as well as co-piloting while we take the Brownie out west. I am an aspiring chef, writer, and traveler. So when Stephen came to me with this idea it took me two days to decide to quit my job and leave Philadelphia to be part of this adventure. It has been a fine summer rustling up support for the project, fine tuning the Brownie, and planning for the journey. We will be merrily bounding forward into a relatively hazy and unpredictable few weeks with our launch date of July 17th. Micah carrying camping supplies for cross country trip. We are starting with a giant camera, a truck, two dudes, and enough gear to keep us alive for a month of driving across America. This is the recipe, but otherwise we’ll be making this up as we go. Camping and pleading with those we know (and some we don’t) to keep a roof over our heads while we speed towards our destination. Our destination you ask? Well, I don’t think we have one in mind, merely a vague idea of a lot of places to see, and people to meet with our lovely traveling companion, Brownie In Motion. 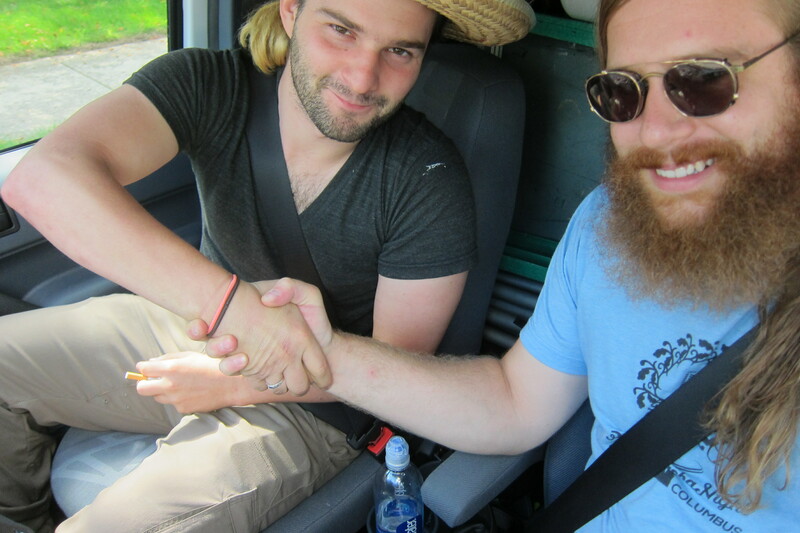 So dear followers, we will keep you updated of our adventures, mishaps, and skews from everyday life on the road. In an attempt to preserve, that might otherwise be forgotten, we forge forward into uncertainty. A huge thank you goes out to my friend and OSU STEAM Factory colleague Roman Holowinsky. I’m not only thankful for his generous donation to the Brownie In Motion campaign but also for his ongoing enthusiasm, and encouragement. Without Roman’s sense of long-term vision, neither the OSU STEAM Factory nor the Brownie In Motion project would exist as we know them today. 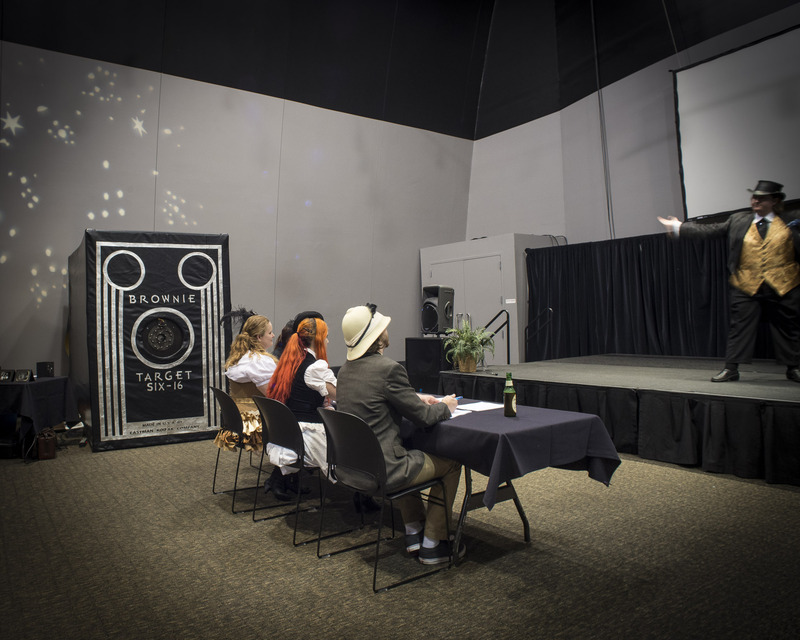 For those of you not familiar with The Steam Factory, our purpose is to promote interdisciplinary collaboration in the OSU community across the areas of Science, Technology, Engineering, Arts and Math. To disseminate research, technology and pedagogy through public interaction and to create new ways in which our work can impact a broader audience. 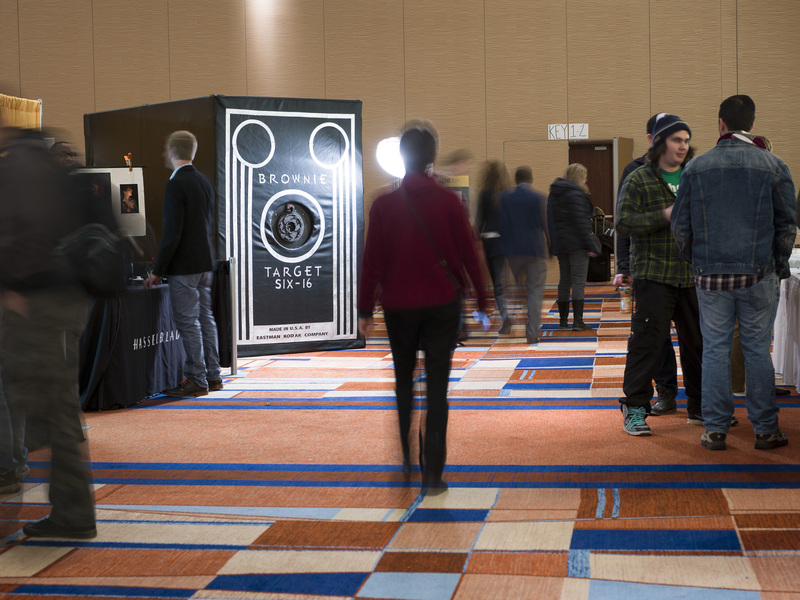 Brownie In Motion was actually constructed with budgetary support from an Outreach and Engagement Grant that the STEAM Factory wrote together. It’s not too late to contribute to the indiegogo campaign! There are 8 hours left so quickly click your way over to https://www.indiegogo.com/projects/brownie-in-motion/contributions/new and donate now! 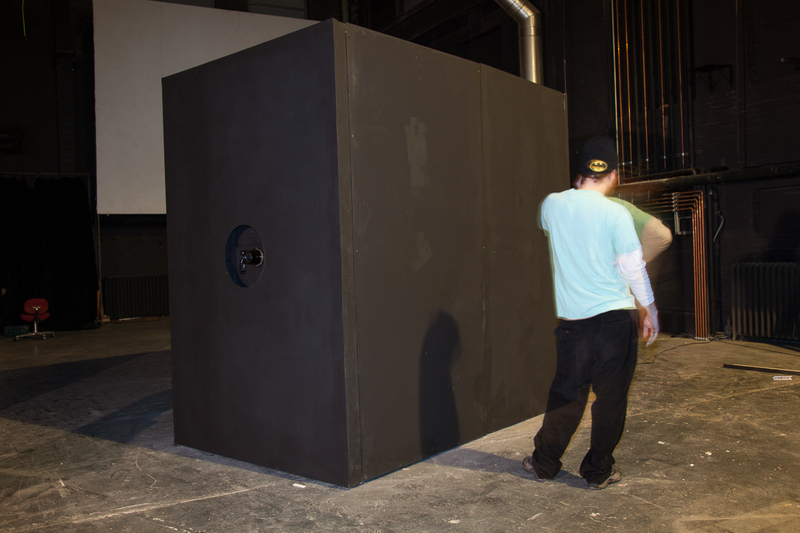 Stephen Takacs standing beside a prototype of Brownie In Motion in the Haskett Hall sound stage at The Ohio State University, circa 2011. I’d like to thank Kenneth Rinaldo for his generous contribution to the Brownie In Motion campaign. Ken has been a driving force in this project since the very beginning. The prototype of Brownie In Motion was actually created during his New Media class at Ohio State while I was a graduate student. Without Ken’s technical knowledge and enthusiasm for this interactive camera, this project may never have existed. Hats off to James Chen! Hats off to James Chen for his generous $150 donation to the Brownie In Motion campaign! Thank you so much my friend! Your enthusiasm, positivity and continued interest in this project is a blessing! Hip Hip Hooray for David Ryan! Thanks goes out to David Ryan for his awesome contribution to Brownie In Motion! Thanks to Amy Leibrand‘s donation to the Brownie In Motion project, we are that much closer to purchasing the supplies and equipment we need to travel out west this summer with the camera obscura! Thank you so much for your help Amy! You are helping dreams manifest! If you’d also like to contribute, please check out the campaign on indiegogo! Lomography, the maker and distributor of so many cool toy cameras, just published an interview with me. Please click the link to read!